Product #15459 | SKU 58TPK1 | 0.0 (no ratings yet) Thanks for your rating! 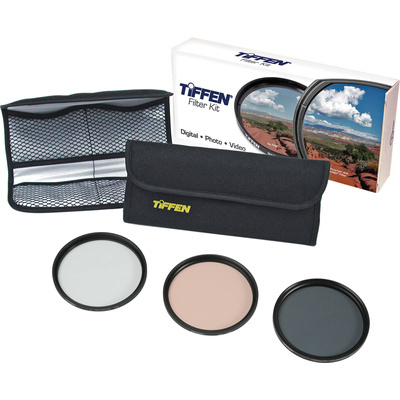 This kit consists of a: a UV Protection filter, an 812 Warming filter, a circular polariser and 4-pocket filter pouch. Haze(UV) filters are wise initial investments. They help protect your valuable investment from dust, moisture and scratches, which can lead to costly repairs. If desired they can be left on the lens at all times for protection. Haze filters provide additional benefits of correction for Ultraviolet(UV) light which can register on film and videotape as a bluish cast and can obscure distant details. Ultraviolet filters allow you to correct for the UV effect to varying degrees. Tiffen's exclusive 812 Filter improves skin tones and is ideal for portraits taken on a cloudy day or outdoors in shade on a sunny day. It also absorbs blue cast often caused by electronic flash and adds warmth to pale washed-out flesh tones. Light rays which are reflected become polarised. Polarising filters are used to select which light rays enter your camera lens. They can remove unwanted reflections from non-metallic surfaces such as water or glass and also saturate colours providing better contrast. The effect can be seen through the viewfinder and changed by rotating the filter. The filter factor varies according to how the filter is rotated and its orientation to the sun. Filter factor is between 2.3 and 2.8 (approx. +1.3 stops). Circular polarisers are specifically designed for use with auto-focus SLR cameras (They will also work on manual systems and video cameras without problems).